As the realisation hit that it wasn't going to get any warmer and a three minute walk to the shops left me with frozen fingers and a distinct feeling of being a bit cold, I decided it was time for a proper winter warmer recipe. 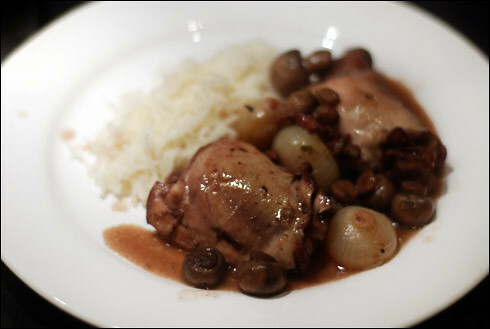 Although coq au vin is extremely simple, it does take time to prepare so is worth making in advance. An added bonus is that it always tastes better the second time round. Pickling onions can sometimes be quite hard to find so if they are unavailable, just use small shallots instead. Place the chicken thighs in a large bowl and add the bay leaves, rosemary, thyme and red wine, then leave to marinate while you prepare the rest of the ingredients. Peel, then top and tail the pickling onions, then fry the pancetta in a large, heavy pan - I used a Le Creuset casserole dish. You won't need any oil as the fat from the pancetta will be enough. Cook the pancetta for about a minute before adding the onions, then fry for a further 2-3 minutes, then add the garlic and mushrooms. Fry for a minute and then set the ingredients aside. Put the flour on a chopping board, then remove the thighs from the red wine marinade and dust them in flour. Next, melt the butter in the pan you're using, and add the chicken. Fry until the skin is golden, then add the red wine marinade, the chicken stock and the onions, mushrooms, garlic and pancetta and season with salt and pepper. Cook slowly over a low heat for 45 minutes to an hour, skimming off any excess fat as you go. You can either serve the Coq au Vin now, or you can reheat it when you're ready to eat as it is always better on second heating! Either way, the meat should fall succulently off the bone. I served it with rice, but it is equally delicious with new potatoes and fresh green beans.